Euler has various methods to solve linear and nonlinear optimization problems. Moreover, the methods of Maxima can also be used. For a first example, we solve the following problem with the simplex algorithm. First we define the necessary matrices and vectors. Now we have to maximize c.x under the condition A.x<=b. We can now compute the maximal value. If <check is off, the Simplex function returns the solution and a flag. If the flag is 0, the algorithm found a solution. If >check is on (the default), the function throws an error, if the problem is not bounded or not feasible. For Maxima, we have to load the simplex package first. Then we can solve the problem in symbolic form. An integer solution can be computed with the branch and bound algorithm using the function "intsimplex". The function ilpsolve from the LPSOLVE package (see below for details and more examples) gets the same solution. 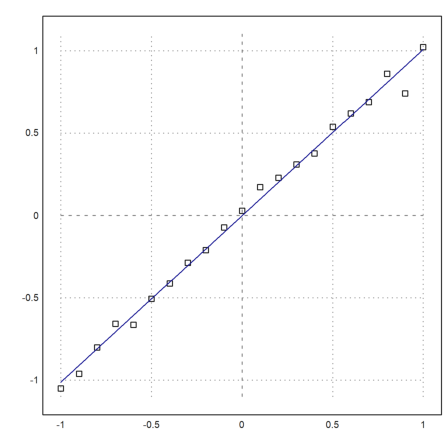 In the case of two variables, the function feasibleArea can compute the corners of the feasible points, which we can then plot. Here is an integer solution. For a demonstration, we solve this system using the pivotize function of Euler, which does one step of the Gauß or the Gauß-Jordan algorithm. We use the Gauß-Jordan form, since it is well suited for this problem. is written in the following scheme. For the output of the Gauß-Jordan scheme, we need the names of the variables, and for book keeping we need an index vector 1:6 for the current permutation of the variables. With that information, we can print the scheme. The Simplex algorithm now requires to exchange x for s2. If we add the variable names, the scheme is automatically printed after each step. Note that the algorithm changes M and n. So, be careful not to run this command twice! Next, we have to exchange y for s2. We can extract the solution with gjsolution(). 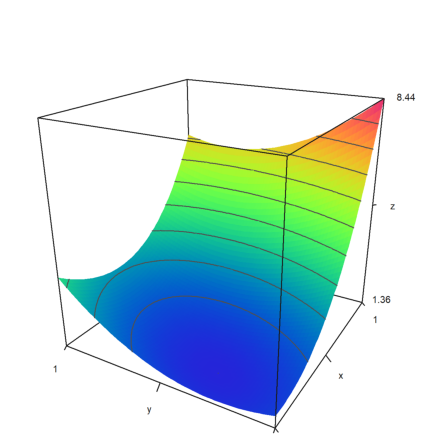 Euler has some methods for non-linear optimization. For one dimensional minimization or maximization of a function, there are fmin and fmax. These functions use a clever trisection, and work for convex (resp. concave) functions. We can also solve with Maxima for the zero of the derivative. So the point is actually exp(-1). Of course, we can use any zero finding method of Euler, computing the derivative in Maxima. A numerical solution would imply the numerical computation of the derivative. So we program that for any expression or function expr. Then we call the secant method, passing the expression as an extra argument to g.
If we plot it in 3D we can vaguely see the minimum. 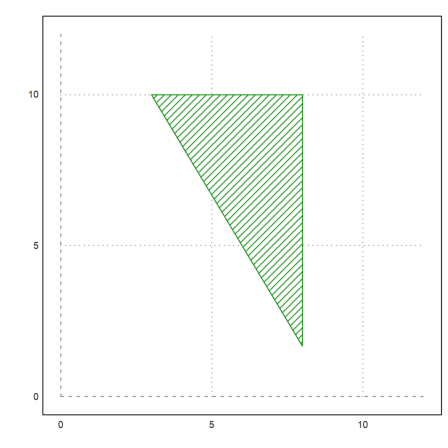 It is better to use a contour plot. The minimum is clearly visible. Now we try to solve the problem symbolically. However, Maxima fails here. The system is too complex. algsys: tried and failed to reduce system to a polynomial in one variable; give up. The Nelder-Mead method solves this very well. 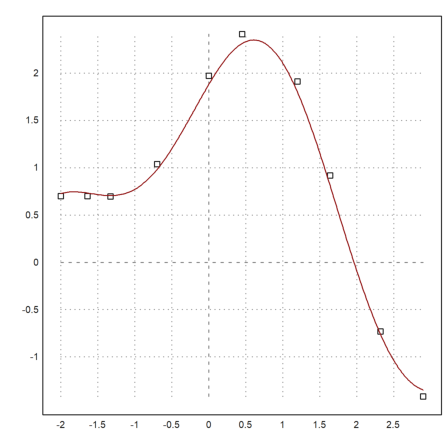 We need to write a function, evaluation the expression at a 1x2 vector. Now we can call Nelder-Mead, passing the expression to the function. Another method without derivatives is the Powell minimization. It is a very good method. If we have the gradient and the Hesse matrix of f, we can solve for the gradient. There is a wrapper function for the Newton method in two variables, which needs expressions for both components of the function. We use it to find the critical point of our function. If we have the derivatives, we can start the Newton method or get a guaranteed inclusion for the solution. First, we define a function, evaluating the derivative (gradient) of f.
Let us check our solution. Then we define the derivative of Jf which is the Hesse matrix of f.
Compute the Hesse matrix at the solution. Now, check if it is positive definite. This is already a proof for a local minimum. The Newton algorithm finds the minimum easily. 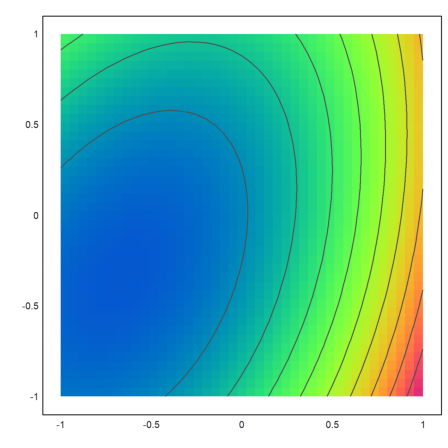 As an alternative, the Broyden algorithm needs only a function, in our case the gradient function. We can now use the interval Newton method in several dimensions to obtain a guaranteed inclusion of the critical point. 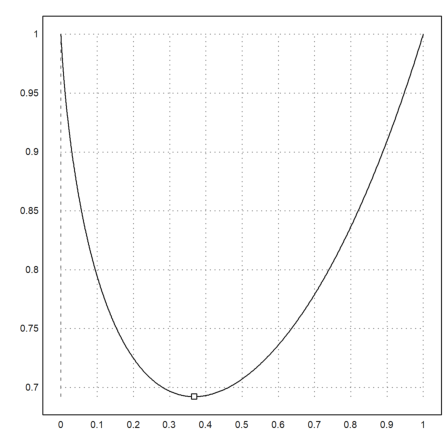 This is a method for non-linear or linear minimization of a a convex function with linear restrictions. Let us try a random linear example first with 1000 conditions and two variables. The Simplex algorithm gets the following result. For the Newton-Barrier method, we need the gradient and the Hessian of f.
New we can start the Newton-Barrier method. instead, and minimize this function. 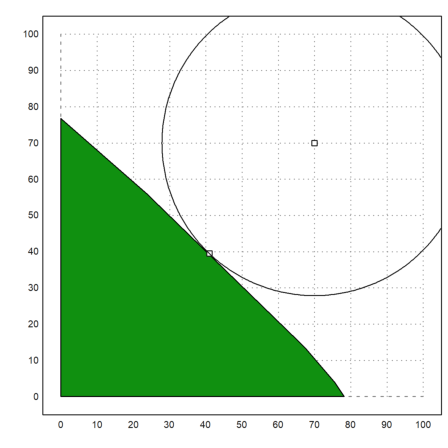 For another example, we search the point of minimal distance to (70,70). We can now start the Newton-Barrier method. Let us plot the result. Next, we want to demonstrate a linear fit. First we assume that we have measurements of y=x with a normally distributed error. Now we fit a polynomial of degree 1 to this. We compute the sum of the squares of the errors, and the maximum error. Assume, we want to minimize the maximum error. We use Nelder-Mead again. Let us compare. This time, the first error must be larger, and the second smaller. 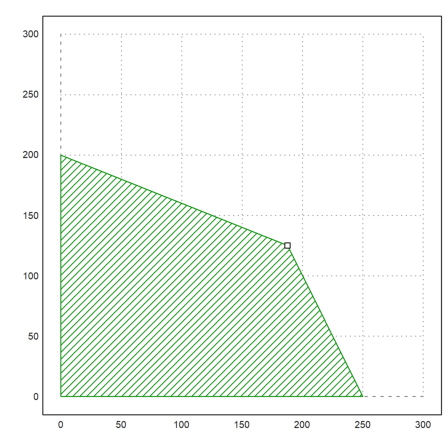 For non-linear fits, there is the function modelfit(), which uses the Powell method by default. You need to provide a model function model(x,p). This function must vectorize (map) to x and p.
Now all we need to do is to call modelfit() with an initial guess. We can use the stable Nelder-Mead algorithm or Powell's minimization. The function modelfit() uses the L2-norm by default. But we can just as well use any other norm. This function can also be used for multi-variate fits. We take a linear model. Here x is a matrix of data points, one in each column, and p is a parameter vector. We now generate such a vector and noisy data, and use fit() to find the best fit. Without the noise, the correct result is [1,1]. We can get the same result with modelfit(). 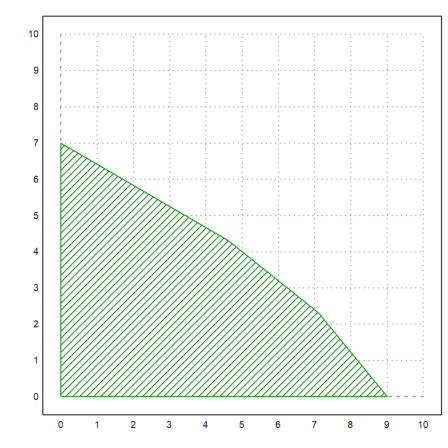 But we can also get the best fit in the sup-norm with p=0. The following example is from the Rosetta page. You have the following items. These items have the following weights each. And for your trip, they have the following values. You are not allowed to take more weight than a total of 400 with you, and you can only take one item of each kind. This can immediately be translated into an integer linear program. The solution is to take the following items. Euler does also contain the LPSOLVE library, ported to Euler by Peter Notebaert. The function ilpsolve uses this package. If you need the package in other form, you will have to start it by loading lpsolve.e. See Notebaert's examples in the user directory for more information. 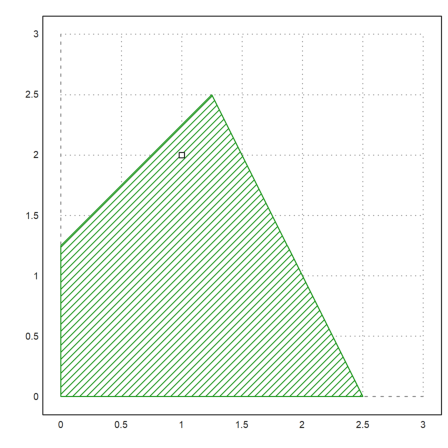 Compare with the slower intsimplex function. We can use LPSOLVE also for non-integer programming. Next, we have a lower bound A.x >= b, and some upper bounds for the variables. Furthermore, we minimize the target function. lpsolve can add such restrictions in a special form. To solve this in intsimplex, we can add the restrictions to the matrix A. The feasible area looks like this. It is always computed with inequalities of the form A.x <= b. So we must modify our matrix again. Now, we restrict only one of the variables to integer. Let us try a huge problem with random restrictions.